No soaking, no grease, no fuss. Efficient cleaning, cleans greasy leftover food completely. Its concentrated formula cuts through grease instantly giving a neat clean. Ultra long lasting suds from every drop. Gentle on your skin, no need to wear rubber gloves. Smells great with two fresh scents to choose from: the trusted Original scent & Lemon. Every drop of Fairy Original provides the ultra long lasting cleaning power you expect for your washing up. Its concentrated formula cuts through grease instantly giving a brilliant clean. 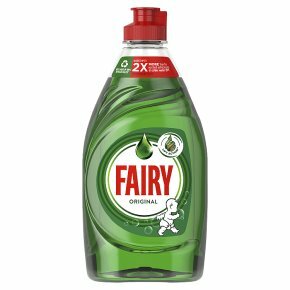 No wonder Fairy Original is the gold standard of washing up liquids. Fairy original washing up liquid is so concentrated that you only need to use a drop without efforts: no soaking, no grease, no fuss.